Murder Mystery Nights, Weekends &Parties in Wales. Ty Mawr is a great hotel venue for your private party with guaranteed exclusive use. Take over the whole hotel with a party of 10 to 16 people and we shall arrange a murder mystery party for you. On the evening of the ‘murder’the guests assemble in the bar for a pre-dinner drink and a briefing to set the scene. The game unfolds over the courses of a three-course dinner and is solved at the end of the meal. Throughout the evening your host will be your waitress to ensure that the evening runs smoothly. We have selected a number of murder mysteries that we can use depending on the size of your party. Whichever mystery is chosen we shall organise the evening with you and before you arrive at Ty Mawr we provide you with character resumes for your murder party. These outline the role that the guests have to play and make costume suggestions which add to the fun of the night. One person needs to decide who will play which devious suspect and invite them to come along as that character. We will discuss the meal with you before the evening and can therefore accommodate any special dietary requirements (eg. vegetarian, gluten free). There are plenty of clues along the way, and of course lots of red herrings to trip you up….and you are guaranteed to have a lot of fun with your fellow sleuths! When the murder has been solved and dinner is at a close there is a prize for the winning “Miss Marple”or “Hercules Poirot”. The whole evening is great fun and, by the end of it, one (or more) of the suspects will be caught out as the murderer! As you will have exclusive use of the hotel for the murder mystery party you do need to book a minimum of five bedrooms as we cannot book them out to anyone else. 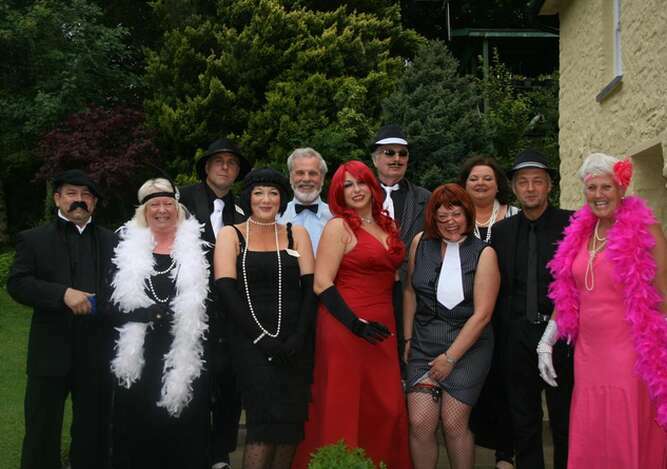 Do call Annabel on 01267 202332 if you would like more information regarding murder mystery parties.